Pursuit Training | What’s Your Tempo? Often during classes in the gym, you will hear or overhear a coach prompting a client to ‘slow down’ or ‘hold at the bottom’ and wondered what do they mean and where do they come up with this stuff? Controlling the tempo(count) of each movement will force your body to adapt in response to the stimulus(exercise). 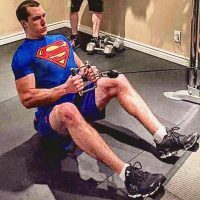 Through incorporating tempo in your workout programs you will see better results in fat loss, you will become faster, stronger and more powerful, and with greater muscle mass you can reduce injury potential. This all sounds great, right? Well, here is the quick and simple explanation of Tempo Training or Time Under Tension Training, which is the theory behind the coaches’ statements. Assume we are starting standing with the weight (if any) and are ready to go. First – Count 3 steamboats as you lower into the exercise. Second – Count 2 steamboats as you pause at the bottommost point of the exercise. Third – Count 1 steamboats as you return to your starting position. Fourth – No rest or pause between repetitions of the exercise. Assume we are starting seated with the V-handle pulled out to our chest and are ready to go. First – Count 3 steamboats as you release, with control, the handle back towards the machine. Second – Count 2 steamboats as you pause close to the machine, but still holding some tension. Now that we have removed the mystery from those numbers on the board with your workout, we will tell you why it is better for you to follow the guidelines set out in your Tempo numbers. Having to pay closer attention to what you are doing will help you develop greater body awareness. Slowing down through all parts of the exercise will improve your control. During slow controlled movements the stress is placed more on the muscle and less on the connective tissue. Slow builds muscle, quicker develops connective (tendon) tissue. When programmed and executed correctly tempo can help to create hypertrophy. If you are struggling with a strength plateau, change up your tempo, under the watchful eye of your coaches, and bust that plateau to bits. Longer Eccentric count has shown to provide greater calorie loss and a higher afterburn through higher post exercise oxygen consumption. Hold at the Bottom offers similar advantages as longer eccentric counts. Combining both helps with fat loss. Explosive Concentric count is a great variation to help to create lean muscle mass. Combine all variations throughout your workout schedule to help achieve maximum results in a shorter period of time. Bottom line – Tempo helps with results. Heed the adjustment the next time your coach asks you to slow down, or hold at the bottom. It will help you achieve your goals, we promise!